Singing River Ranch is one of Colorado’s most scenic, exclusive, and pristine ranches, nestled in a protected river valley at the base of Blanca Peak in the Sangre De Cristo Range. This approximately 6,100-acre ranch has end-of-the-road privacy walled by mountains on either side with rivers, creeks and ponds, alpine terrain, irrigated meadows, rolling hills, and glades of aspen, pine, spruce, and fir. It represents one of the last private holdings in this spectacular valley with views of surrounding 14,000-foot peaks and adjoining national forest and wilderness that rival the Alps and Andes. Situated in southern Colorado at the headwaters of the Huerfano River, the ranch has valuable wildlife habitat for trophy elk and mule deer, with bear and bighorn sheep, as well as several other mammals and raptors. The river, creeks, and ponds offer fly-fishing for native Rio Grande Cutthroat and other trout species. Singing River’s diverse terrain and adjacency to hundreds of thousands of acres of national forest affords endless recreational opportunities including mountaineering on the neighboring peaks, pack trips to the Great Sand Dunes National Park, hiking, biking or solitude in your own private wilderness. The ranch also offers high quality grazing for cattle with ample grasses and water, and it currently leases 14,200 acres of National Forest as well as BLM and State lands. Within the river valley floor is the main headquarters with exquisitely landscaped grounds highlighted by the Huerfano River that meanders through the compound fashioning several stocked ponds. This area contains two custom log homes, a beautifully restored five-bedroom bunkhouse, and barn. There is also a historic fishing/hunting cabin at the base of another pond higher up on the ranch, ultimately leading to a Patagonia inspired refugio cabin with incomparable views in a wilderness setting. This is a unique chance to own a private recreational ranch with significant conservation values in a spectacular setting with abundant wildlife and recreational opportunities. 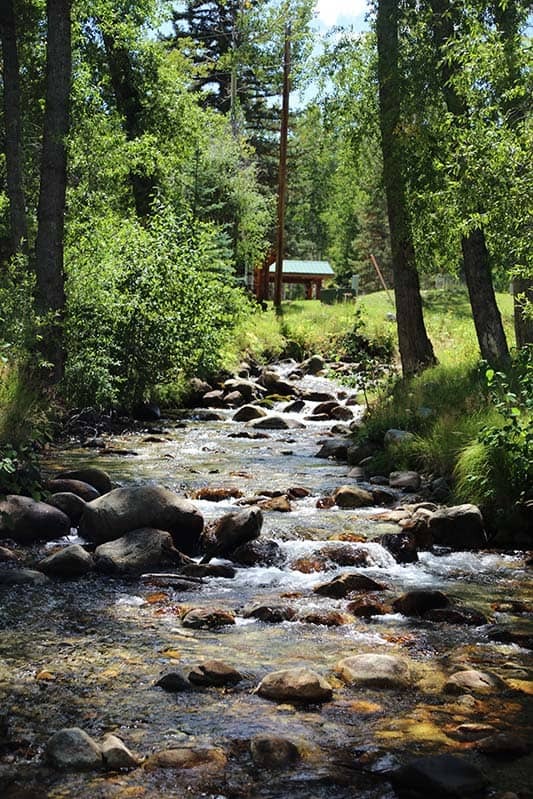 Singing River Ranch is situated at the base of Blanca Peak in the Sangre de Cristo Range in south central Colorado. This 6,100 acre deeded private ranch with sweeping views is comprised of one contiguous block and totals over 20,000 acres with the inclusion of the grazing on the adjoining National Forest. The ranch represents one of the last privately owned holdings in the Upper Huerfano River Valley. Elevations range from 8,500 feet near the headquarters to 10,500 at the upper end of the National Forest boundary. The area is rich with scenic beauty, endless recreational opportunities as well as interesting history. The ranch is located at the headwaters of the Huerfano River and the Wet Mountain Valley. This picturesque high mountain valley is between the Sangre de Cristo Mountains to the west and the Wet Mountains to the east. The valley provides a unique mixture of working ranches and stunning views of the Sangre de Cristo Range, which is the longest range in Colorado and contains ten named 14,000 foot peaks. The ranch itself contains extremely attractive scenery with views of aspen woodlands, dense forests, and attractive grasslands and meadows rich with native grasses and wildflowers. The property possesses the visual and aesthetic characteristics of rugged mountains, pristine natural forests, and traditional western ranches. Singing River is walled to the west and south by the Sangre de Cristo Mountains and provides stunning views of three adjoining 14,000 peaks including Blanca Peak, Mount Lindsey and Ellingwood Peak. Blanca Peak is Colorado’s fourth highest peak and the largest peak in the Sangre de Cristos. The ranch is adjacent to 3.4 miles of the San Isabel National Forest which adjoins the Sangre de Cristo Wilderness Area and the Great Sand Dunes National Park. Much of the surrounding National Forest is essentially roadless and in pristine natural condition, providing outstanding wildlife habitat and backcountry recreational opportunities to thousands of acres of National Forest system land. One can ride on a horse from the ranch along the Zapata Pass Trail along the spine of the Sangre de Cristo Range or summit the adjoining peaks via Lily Lake Trail. A large Spanish land grant, which includes the Forbes Trinchera Ranch, encompasses a substantial portion of the range to the south. The Huerfano State Wildlife Area borders the ranch to the east. Singing River Ranch includes remodeled homes, cabins, a bunkhouse, and a barn. Most of these improvements are situated near the entrance along the Huerfano River amidst professional landscaped and groomed grounds that provide a park-like setting. The river meanders its way past the homes filling numerous ponds and there are outdoor entertaining areas near the homes, river and ponds. The offering includes the main house which is a 3,900 sq.ft. log home with three bedrooms and a master suite. The guest log home is 1,900 sq. ft. and has two bedrooms. The current owners recently remodeled the 2,900 sq. ft. bunkhouse which has four bedrooms, a large spacious kitchen with custom cabinets and professionally designed décor with a large great room. There is also a custom built barn with horse stalls and an office. A restored log cabin, used as a fishing, hunting cabin or quiet retreat, and another historic cabin are located along Deer Creek. From Interstate 25, take exit 52 at Walsenburg and go west on State Highway 69 25 miles to Gardner, then 12 miles to Redwing, and an additional 4 miles on Huerfano County Road 580 to the ranch entrance. Ranch is located approximately 3 hours from Denver, 1 1/2 hours from Colorado Springs and Taos, and 3 hours from Santa Fe. The ranch provides extremely valuable and pristine habitat for many species of game and non-game wildlife. Big game species include elk, mule deer, black bear, mountain lion and big horn sheep. There are resident herds of elk and deer on the property. Elk are most abundant on the ranch in the spring and fall when 500-600 have been seen in recent years. Elk stay on the ranch to calve in early summer and remain for the season. There is also an abundance of mule deer on the ranch which occupy the ranch year-round, except when winter snows force them to lower elevations. The current owners have seen up to 200 deer on the ranch, including many large bucks. Bighorn sheep have been seen on the ranch as have black bears. Wild turkeys have also been seen on the property and the forested parts of the ranch provide nesting habitat for a number of species of raptors. The Huerfano River provides coldwater stream fishing for many species of wild trout including browns, rainbows, brookies and cutthroats. Fishing is also available in the many stocked ponds on the ranch with brookie fishing in the several miles of additional streams that flow through the property. The Singing River Ranch is perfect for the adventurer with infinite opportunities for mountaineering, climbing, hiking, mountain biking, and horseback riding. The ranch has good water rights and has irrigated and sub-irrigated hay meadows and numerous pastures. The Huerfano River and several tributaries flow year-round through the property. The Huerfano winds through the headquarters for approximately ½ mile, Deer Creek flows through the ranch for approximately 3.3 miles, Sheep Creek for 4 miles, Rito Oso for 2.2 miles, and Aspen Creek for 1.5 miles. In addition, there are several ponds up and down these riparian corridors. About 65 acres along Deer Creek is sub-irrigated by natural groundwater providing wet meadows. The river, creek and ponds provide excellent water for recreation and livestock and provide sanctuaries for all types of wildlife. Property also includes several adjudicated springs, well permits and an adjudicated diversion from Deer Creek. The ranch also includes 184 acre feet of water storage in the Sierra Blanca Reservoir aka Montez Reservoir that can be used for irrigation, recreation, fish propagation and fire protection. The reservoir adjoins the San Isabel National Forest and sits in a picturesque setting just below the towering peaks. This water can be used to further expand irrigation on Singing River Ranch and to create more water features on the ranch. The ranch also has recreational use of the Wilson Reservoir that is situated on the ranch along the Dry Creek drainage. The ranch currently grazes cattle on the deeded ground as well as the adjoining state and federal lands. The Forest Service permit allows for 200 cow/calf pairs to graze for 2.5 months during the summer months and there is plenty of forage and access to water for a small cattle operation. The ranch has such important and critical natural habitat for plants and wildlife and attractive open space of a pristine natural character with magnificent scenic values that a conservation easement was placed on 800 acres near the headquarters. The remaining 5,300 acres is unencumbered. These important qualities will forever be protected for the use and enjoyment of any prospective buyer and their heirs and assigns for generations to come. The 800 acres protected by the easement is generally along the Deer Creek drainage. The easement reserves a building site for one home and permits the construction of additional buildings for agricultural and recreational purposes. The conservation easement was conveyed to the San Isabel Foundation, a local land trust whose mission is to provide for the preservation of agricultural land, historic sites and structures, open space, scenic beauty, wildlife, water and other natural and historic resources along the Sangre de Cristo Mountains.